What follows is the 4th of eight disaster lessons from site. We ask what went wrong and review what we’ve changed in our practices to prevent it from happening again. An archive of the series can be accessed here. The project was located an hour and a half’s drive south of Melbourne. The builder’s construction schedule required that he be on site on irregular days, making regular site meetings difficult to coordinate. Consequently, site meetings were never arranged, with most questions addressed either via phone or the occasional meeting in Melbourne. Talking through construction details on the phone was far from ideal, particularly in terms of maintaining clear paper trails for decisions, but it was manageable. If this had been the only hardship, the real issues created via the lack of site meetings likely would never have been revealed. However, while the project proceeded well during the early stages of construction, progress slowed substantially during the finishing trades. This was not specifically related to the absence of site meetings, but without regular, face-to-face opportunities for communication, the lack of movement on site grew increasingly frustrating for the clients. The relationship between the clients and builder thus became tense and, caught in the middle, this tension began to affect us also. As the final weeks of the project stretched out across months, the lack of personal contact became exponentially problematic. We found ourselves acting as mediators between clients and builder. We relayed messages back and forth constantly and had the same futile conversations over and over again, all while absorbing the dismay of our clients as if by osmosis. The builder’s request to avoid site meetings, and our readiness to agree, came from our shared misapprehension that they would inconvenience the construction process rather than facilitate it. Indeed, reflecting on other projects, and our sense that builders sometimes itch to end our meetings and get back to the “real” work, it’s likely this belief is not isolated. For this project, the rural location of the site combined with the builder’s sporadic presence there were enough for us to let site meetings slip off the radar. In hindsight, the driving time required to get to and from site would have been more than compensated for by the benefit of having regular opportunities for clients, builder and architect to meet in person. The lesson we learnt therefore is to insist on site meetings, every two weeks at least, throughout the entire duration of the construction process. We would add that this should be the case even if progress is for some reason retarded or delayed: the builder is driving progress, but it is only through the combined efforts of builder and architect that he can navigate also. The clients continued to live on site during construction, which exacerbated their frustration. Having the client so close to the building process is another disaster waiting to happen, though is unfortunately outside our control. 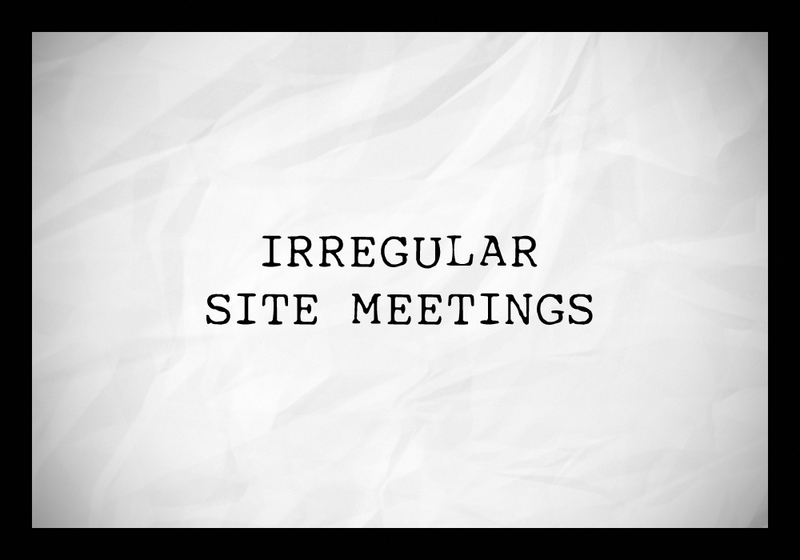 Irregular site meetings, author’s own image.